As the senior partner in the well-known firm of Abraham, Watkins, Nichols, Sorrels & Friend, Nick C. Nichols handles major litigation involving catastrophic injuries, wrongful death, products liability, representation of sports celebrities, and business litigation. His courtroom success as a civil trial litigator and the esteem in which he is held by the legal profession have led to invitations to join the prestigious American College of Trial Lawyers, International Academy of Trial Lawyers, International Society of Barristers and The Inner Circle of Advocates. 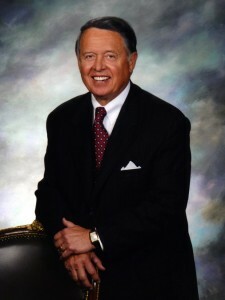 He has been listed consistently in Woodward White’s “The Best Lawyers in America.” Nichols received the Southern Trial Lawyers Association War Horse Award in 2003 in recognition of his outstanding professional accomplishments. He has been an adjunct professor at South Texas College of Law and a frequent lecturer at law schools, legal seminars and Rice. Nichols is a Keeton Fellow at the UT School of Law, where the Nick Nichols Endowed Presidential Scholarship has been established. Rice Athletics is the beneficiary of the Nick and Linda Nichols Men’s Basketball Scholarship Endowment. One of Nichols’ noteworthy victories resulted from a case known as “The Punch,” which involved the serious injury of Houston Rockets forward Rudy Tomjanovich, a victim of a vicious punch thrown by an opposing player. This case resulted in a substantial judgment and had a profound effect on professional basketball and sports law. The NBA responded with important safeguards to discourage recurrences of such misconduct, and the precedents set by this case provide the opportunity for redress for future victims. The key words honesty, integrity, morality, credibility, candor, fairness, responsibility, civility, and preparation rise to the surface to clearly define and prescribe the standards expected of lawyers in the performance of our profession. Scholars define professionalism as the art of having assured competence handling matters within the individual’s expertise and experience. Many lawyers possess a high degree of competence, expertise, and experience, but I believe the true professional is one who exercises these while always playing by the rules. The practice of law will remain and honorable and valued pursuit as long as each of us continues to aspire to the lofty principles of the profession.